Tucked away in a tree-filled residential neighborhood, Woodridge Apartments offers peaceful surroundings and a park-like setting that might make you forget you’re just minutes from downtown Rochester, New York! The Irondequoit Bay is also nearby, providing a beautiful respite filled with parks and marinas to enjoy anytime you like. 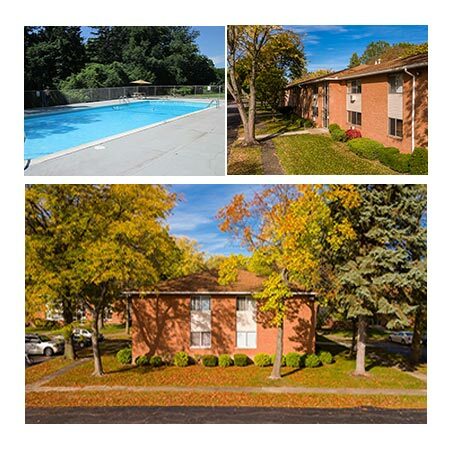 Woodridge Apartments is the only apartment complex in East Irondequoit with a swimming pool! Our property also features lushly landscaped courtyards, well-lit parking areas, and laundry facilities in each building. Heat and hot water are included, and we provide 24-hour emergency maintenance. Our apartments are spacious and bright with open floor plans. Depending on the phase, your apartment may include a walk-in closet, a washer and dryer in-unit, or handicap accessibility. Woodridge Apartments is family owned and operated, and has been for more than 40 years. We make your needs our number one priority, and our knowledgeable office staff is available to answer your questions and concerns. Isn’t it time to come home to Woodridge Apartments? Call us today to schedule a tour!